If you wish: breakfast 4-5 CUC, dinner from 8 CUC (cuban peso convertible). Shorter stays are possible, but please check our Reservation fees. True, the finest beaches in the world but, sorry guys, private homestays in Varadero Beach are frequently booked out. Many travellers, regardless of their flight arrangements, choose to stay overnight in Matanzas and enjoy the numerous attractions in Varadero during the day. Some go to swim with the dolphins, others rent yacht trips, walk along the long beaches, shop or go to the shows. There are bus connections (VIAZUL) from Matanzas to Varadero (about 40 Km) and taxi is never a problem. 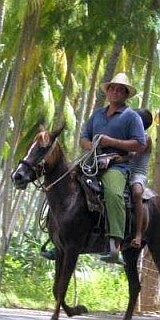 Cuba-experienced travellers use hitchhiking opportunities (ADVICE: the pick-up point on the railway crossing behind the Sausa-Theater, just 5 Minuntes from Casa). A small beach El Tenis is situated about 4 Km from Casa Alma, along the Malecon sea shore boulevard. Another beach, Playa Coral, about 15 Km. Playa Coral is suitable for diving. Both are small and not as impressive as the beaches of Varadero. Below photos sent by our guests. Thank you! Ich möchte mich nochmals herzlich bedanken für die Zuweisung der Casa particulars in Havanna und Matanzas. Es hat alles bestens funktioniert und war in Ordnung. Aber besonders möchte ich das Hostal Alma in Matanzas loben. Ich hatte ein sehr schönes Zimmer und Meira und Idelvis tun wirklich alles für die Gäste. Ganz offene, ehrliche liebe Leute. Deshalb verdienen sie weiterhin von Ihnen höflichst empfohlen zu werden. Ich bitte sie das zu tun. Und wenn Gott will besuche ich sie nochmals.